This used to be the largest township on the Island, but portions were sliced off and reallocated to Balephetrish and Crossapol. Local tradition has it that Kenovay was the home to the largest fort on the Island and it was here that the general armoury was deposited in antiquity. The fort was reputedly demolished to enable the building of the stone dyke which runs from Kenovay gate to the Crossapol shore below Island House, the home of the Duke of Argyll. 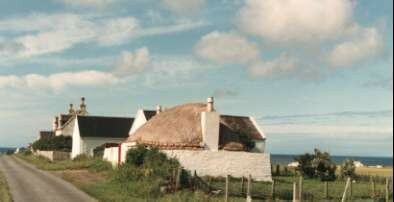 Kenovay is the site of St Finan's Chapel which is to be found northwest of the house, Rossdhu, less than a quarter of a mile from the shore. The site of the Chapel may be seen if you look carefully, the accompanying grave mounds to the side of the chapel, all but obscured most of the year, are said to be those of young, unbaptized children, date unknown. 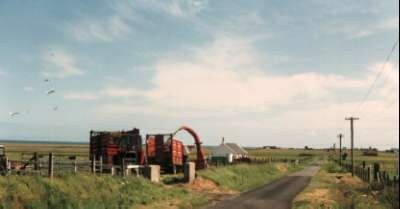 Fionas Craft Shop is the only business in an otherwise crofting dominated township. Fiona specialises in marketing the goods of the crafts people of Tiree and her shop houses a Gallery which showcases a selection of work by local artists, both professional and amateur.